U.S. sees lower energy costs while Australia and Europe’s renewable energy mania creates energy price spikes and supply disruptions | Watts Up With That? The Energy Information Administration released electricity price data on October 6 for the first 6 months of 2016 showing lower residential prices compared with the same period in 2015 largely driven by lower cost natural gas availability. Also on October 6 Australian Prime Minister Malcolm Turnbull slammed renewable energy obsession for causing South Australia’s energy price spikes and state wide blackout. Household electricity prices in Australia have risen 40 percent between 2007 and 2012 with Australian states pushing heavily subsidized wind energy reliance having rates nearly double those of other states. In addition to the recent wind energy caused state wide blackout in South Australia electricity price spikes there have occurred pushing rates to 8 times higher than the average in Australia. Europe lead by Germany’s headlong push into costly and unreliable renewable energy experienced nine month high spot power prices (http://www.reuters.com/article/europe-power-spot-idUSL5N1CC1QI) on October 6 based on a sharp fall in renewable power output coupled with French nuclear power lowered projected base load production during the coming cold months. The German base load power price jumped form 5.75 Euro’s to 38.25 Euro’s. California Governor Brown’s push for excessive reliance on unreliable and costly renewable energy in the state has lead to higher electricity costs and exposed the state to increased electric system stability concerns because of the need for significant out of state power to maintain system reliability. So while other states in the U.S. see the benefit of increased use of natural gas without heavy handed renewable energy mandates California’s energy course remains mired in globally irrelevant purely politically driven climate alarmist baloney. October 9, 2016 in Energy. Ahm, yes, but you’re ignoring the “external costs” associated with fossil fuel usage, i.e., the negative effects of carbon “pollution”. yah. the 40 years of extended lifespan for which you can kiss the nearest, sootiest smokestack, has given us the negative externality of your continued existence. but nobody can afford the cost of YOUR personal carbon. stop leaving footprints on the planet. Tell me something: how much More will your food cost without fossil fuels to get it to your grocery store? How much Less time will your food last when there’s no energy for your refrigerator? What are the ‘negative effects’ of not being able to heat your house in -30C weather? There is NO negative to CO2 release. It is purely and absolutely beneficial to the whole planet. Do you know much about probability Andy? A cryptic and provocative one-liner, but how much do you know about “probability”? You must predict the future for us, please. I know you don’t bet the farm on a thousand to one shot. Especially if the horse has failed to start in it’s last three races. The “external costs” of command and control dictates based on the flawed premise of “carbon pollution” are what you are ignoring. Adding RE doesn’t directly reduce CO2 emissions. If adding RE to a market pushes out nuclear and forces a mix of coal and gas to fill the gaps left by the nuclear plants, the net result is increased emissions. In MISO and PJM (which serve a large fraction of US electricity), there is a real possibility of this happening. During a severe cold snap in January 2014, one grid that feeds the eastern U.S. almost failed. Came within a few hundred MWs of this happening. Failure would have left millions without power. In Michigan, which faces a power shortage in the very near future, the loss of only one nuclear plant can cause the state serious problems if power can’t be brought in from elsewhere. Yet the Michigan government and some organizations are pushing for more renewable energy. This is not good news for the Michigan manufacturing sector. And Michigan is part of MISO. IWTs are now being pushed into the rural Michigan Thumb area and beginning to be pushed into other rural areas of Michigan. Maybe something like 2,500 IWTs into the Thumb area. The PJM interconnection also serves the District of Columbia/D.C. The Nanticoke, Ontario HVDC 1,000 MW merchant lines, Lake Erie, connection to near Erie, PA, which is now in the approval process can be expanded to 2,000 MW if there is enough demand. Two 500 MW cables. As I understand, the first 1,000 MWs are now fully subscribed. Article mentions increased costs of electricity. Looks a little weird there. Doesn’t each state have an energy minister? Soon, each parish – even each household – will have their own ‘minister’ for energy. Carbon is not pollution, carbon is the essential building bloc for life on Earth. Carbon dioxide is not pollution. Carbon dioxide is essential to life on Earth. CO2 is plant food. Plants “exhale” oxygen. Humans need oxygen to live. Animals also need plants for food. Plants start to die off at about 180 ppm of CO2. As the plants die, the animals die for lack of food leading to a mass extinction. At 280 ppm Earth was dangerously close to a mass extinction. The increase in CO2 to 400 ppm has increased the buffer before a mass extinction. Commercial growers increase CO2 to 1000 ppm to improve growing efficiency. For extended periods of geologic history CO2 was at 4000 ppm. It is only at 8000 ppm that CO2 starts to have a negative effect upon breathing by mammals. Trebla, please stop calling carbon and/or carbon dioxide pollution. Trebla is probably scared witless by the presence of Dihydrogen Monoxide all over the planet as well. CO2 is not a “Pollutant”. The CO2-Climate Change hypotheses have been Scientifically Falsified by the [100%] Empirical Failure of their own Predictions, therefore including all of the alleged, even Apocalyptic “externalities”. On the other hand, ignoring the externalities involved with Solar and Wind subsidies and use should end up making you and your fellow CO2 Warmists owe the rest us a lot of money and a lot for what money can’t buy in terms of deaths alone. We won’t even any new Laws to proceed against you. Your kind of Scam and Liability is not new, it’s just the largest ever. The advocates will still argue for the desirability of renewables despite the costs (Yes, I mean you, Roger Sowell). I keep getting offers to switch to electricity provided by 100% renewable sources. Of course I have to pay a higher rate if I do so. There is no mention of what happens to my electricity if there is a shortage of renewable energy for whatever reason. SRI, you are being lied to. “Your” electricity comes from where “everybody’s” does. Electric transmission and distribution systems can’t differentiate the sources of electrons. Shortages of renewable energy are made up by reliable, mainly fossil, sources. Those shortages happen every day. Everybody pays the subsidy. I thought they painted the electrons green before they were let on to the grid. So they would like you to think, SRI. They count on the rubes to fall for that line. It is becoming apparent that the big 800 kg gorilla in the room is storage of excess generated electricity. That means there is more electricity being created out of other forms of energy than the utilities currently have customers for. That means this minute. Solar PV and wind can be obtained quite well at off peak load demand hours, if the sun shines, and the wind blows and the creek don’t rise. But at those times of the day, nobody has a use for the electricity so they will only take it if it is much cheaper then. Then when there is a peak load demand, and the rate is higher because of that demand, you discharge the batteries into the grid. It’s the old “buy low, sell high” money making trick. But the skunk in the woodpile is that big battery. Well you see the Grand Coulee Dam is a big battery. Excuse me, I mean a whacking great big battery. Nobody has made an electricity battery as big as the grand Coulee Dam, or is ever going to. I understand that Germany is now capacity rich in their renewables energy system, and at times have head to PAY customers to take it off their hands when it is there, so it is a negative for their economy. At other times they can export it to other countries at a lower price than they want to. So this is a headache that has to be dealt with. With windmills it is simple. You just shut those 5 megawatt wind turbines down and park them so they aren’t grinding up their gears, and bearings, while putting out nothing. But not so easy with solar PV. You can’t just turn the solar panels upside down like they do at Ivanpah when they don’t want to roast birds and bats. Even KFC sometimes doesn’t need that much chicken. So the problem is that it is a question of how many megawatts peak battery load capacity do you need to go with say a 5 megawatt turbine to keep it running all the time that the wind blows within its very limited useful wind speed range. You clearly need to be able to supply energy from the battery at something related to the 5 megawatt capacity of the windmill. Then you need a certain number of gigawatt hours of storage capacity in that battery at that 5MW or whatever it is rate. Then you need to be able to pay back the cost of that battery from the price advantage, before the battery curls up its toes and drops dead. Grand Coulee Dam is so exquisitely controllable to respond to load demand fluctuations. Wind turbines are basically uncontrollable. You have NO knob on the wind speed. Yes you can feather props, and evidently intelligently as they rotate while staying phase locked. Incidentally does anybody know if it has been considered to just let a wind turbine run freely at whatever rotation rate it wants to, within some safe design limit speed range, so that it generates three (or more) phase AC at whatever the heck AC frequency you get, and then use Power Electronics to turn that chirpy AC into phase locked 60 or 50 Hertz grid frequency. Perhaps the necessary power electronics will be developed out of UC Santa Barbara’s Gallium Nitride high power semiconductor program. If you can make 1200 volt GaN transistors, you can design your alternators for that voltage; (the alternators would need electronic voltage control as the RPM varies), and then all you need is enough Amps. That’s only 1250 Amps at 800 V RMS per megawatt. 6,000 Amps for a 5 megawatt turbine. That’s chump change as high power electronics goes these days. Well you might need 7,000 Amps to allow for some slippage. These guys believe they can get conversion efficiencies that are north of 95 % in to out. Wind might make more sense if you can run the turbines off line, and do AC to AC frequency conversion electronically. PS you read about it first; right here on WUWT. My wife’s uncle helped build the Grand Coulee Dam. Later he was a boiler operator to generate electricity for ConEdison in Illinois. Buying low and selling high is a strategy, not a trick. It is how my investments make money. As the saying might go, SRI; How come are you on this blog? The huge Pacific NW generation and transmission system allows exports to CA during favorable hydro conditions. There are limits, though. To learn more about the hoax of human-caused climate change. I wonder what those leftie film industry people will say when CA experiences widespread blackouts? why not? If you can afford a mansion then you can afford a on demand generator run by reliable natural gas or diesel fuel to power it when normal service is interrupted. Turnbull is a sustainable energy weathercock. He is reliable only to check which way the energy debate is blowing in Australia at the time and will change direction with the political wind at any time. I think it’s worse than that. I agree that Turnbull’s recent statements are pure political opportunism, but I also think that, given any sort of choice, Turnbull and Greg Hunt push the green cause as much as possible. BTW, notice that yesterday the wind in Victoria was stronger than the blackout-causing winds in SA, and Victoria didn’t lose power at all? I’ll be triumphalist while I can, because when Hazelwood Power Station closes down, Victoria will be well into permanent brownout territory. At the recent COAG energy conference that was called in the wake of the South Australian blackout, the “independent” panel that was announced was tasked to “ensure future energy security, affordability and sustainability as more renewable energy comes into the electricity system and more coal-fired power stations close” and there is still a federal target of 23.5 per cent by 2020. The panel is headed by Australian Chief Scientist Alan Finkel who has qualifications in Electrical Engineering (doctorate level) but has never worked in the field and talks like a starry eyed, solar (PV and CST), battery proponent. None of the state energy ministers backed down on the stupid renewables targets that they have set.. In Melbourne (population 4.5 million) our big wind storm had gusts equal to the South Aussie situation but not the rain or the massive lightning. Melbourne and Victoria did get significant outages, most restored within a few hours. The worst affected being our outer, and then, outer again areas which are up high, heavily tree lined and places which have experienced a fair whack of recent rain. And the trees came down and the power poles and lines come off second best. And in outer Melbourne we grow our trees big and then bigger. Today is a workday and basically it is business as usual but there are still many residents in these outer areas still waiting to resume services. The Age OCTOBER 10 2016 – 10:49AM. The biggest problem we have in Melbourne is that our power lines are above ground and on windy days their natural enemy, the trees, come down hard. I know we have tried to put the lines underground as an experiment but I do not know the outcome. Do we have any Technical experts in this area who could tell us if it is realistic and cost productive to power a major city by placing the power lines underground? Regarding under grounding Melbourne’s power, I did a study on that for the State government some time ago for the whole of Victoria. It would take more than 10 years and in today’s money, more than 10 billion, so they did nothing. Surprise! “Lead” when pronounced “led” is only the metal. The word that you want in at least two places is “led” (the past tense of “to lead”). This is a very common error and I wonder how it ever got started….. In the sentence: “The German base load power price jumped form 5.75 Euro’s to 38.25 Euro’s”, “form” should be “from” and “Euro’s” should be “Euros”. The article is good, but the small errors detract slightly. I agree. I always notice these errors and they do detract from the articles and thus distract the reader. for Christ’s sakes.. to maaatoe , two mahtoe. the world dying and your worried about truckin’ spellin’ errors. and your primary consideration is criticizing people who are literate because the world is dying? plz- don’t get cremated! give everyone a last laugh! When writing an article, it is important to maintain proper grammar and spelling, else you be seen as illiterate and the veracity of your information put in doubt. Those mistakes are less forgivable when the author has the time to proofread before publication; more forgivable when making on-the-fly comments. For many, the quality of an article is, to at least some degree, judged on the attention to detail of grammar and spelling. Such lack of attention to detail is lost on the poorly educated reader. Yeah, but ” you’re”, not “your”. Illiterate does not mean “poor with grammar or spelling”. Illiterate means “cannot read or write”. Like, at all. I’m no grammarian but I read some dozen languages, classical and modern, and have taught a couple of them. Can I add my voice to those who couldn’t give a bugger about one little grammatical error in this article? By all means alert the author by email if it matters so much to you. But did we have to cop the lecture? mosomoso is a big guy. I’m told intelligence has nothing to do with arbitrary notions of grammar. Well, one last thing. I was a technical writer and then a technical editor for many years. Based on that experience, I know a writer cannot usually accurately proofread his own writing. That is why there are editors. No good, the U.S. has got to get on board with the destabilizing Green Energy program or else Soros et. al. and their bought politicians won’t be able to profit when it all collapses. They can’t hold on to their “shorts” (against the U.S. economy) forever you know. They can just eat their shorts. 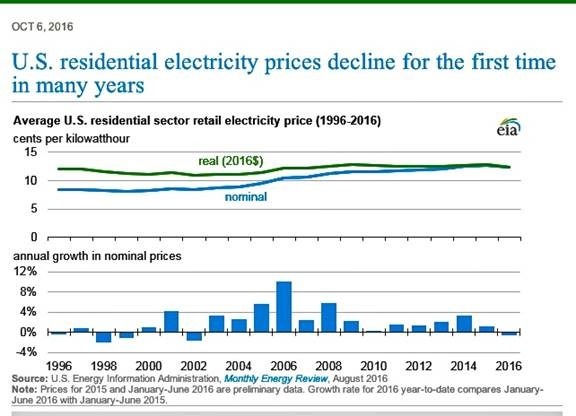 The reduction in US electrical prices is a forth order response to an administration hostile to US economic success. 1) Punish the USA economy and population by regulation and tax results in 2) Higher unemployment, and reduced output, resulting in 3) reduced consumer demand for EVERYTHING, resulting in 4) lower fuel ergo, electricity prices. Yeah in a depressed economy with 0% interest rates, prices fall. What is going to happen to CA business and industry over time? Hide the decline? Hide the increase! That’s what I was thinking. This has to hurt Calfornia’s economy. It’s a huge tax. Taxes stifle economic activity. “Through subsidies and feed-in tariffs, the government promoted a massive expansion of Ontario’s electricity capacity. At the same time, demand for electricity went into decline as economic growth slowed and consumers cut back on electricity needs. Soaring supply, falling demand and mandatory pricing is a recipe for economic chaos. And the shocking thing in Ontario is that wind power installed capacity is still only 10 percent of the province’s generating mix. Solar and biomass come in at 1 percent each. We’ve still got 36 percent nuclear, 24 percent hydro (most of whose installation costs were paid off generations ago) and 28 percent gas. If our brave leaders hadn’t realised that things were getting crazy and started to cut back on new wind power contracts, we would be looking at far higher prices in the future. Those numbers are installed capacity; wind power accounted for only 6% of the total power produced in Ontario in 2015. The nukes supplied 60% – without them we would be in a really sorry state. The Ontario wind generation situation is even worse than you suggest. 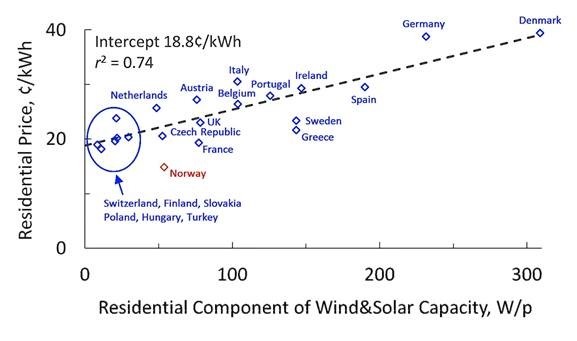 The “installed capacity” figure of 10% assumes all turbines running at full rated capacity. The actual power generation capacity is dependent on average wind speeds across the province. For Ontario the annual all-season average wind power capacity factor is around 25% of installed capacity. So actual effective installed wind generation capacity is closer to 2.5% of the total generating mix. 1) Most countries subsidize RE through feed in tariffs. These set the income for RE plants, independent of the value of the energy they produce and their cost. The US subsidizes RE primarily through tax credits. These lead to increases in income TAXES, rather than increasing electricity RATES. 2) The other impact of feed in tariffs is that they prevent competition. Most RE in the US is added to the system through competitive bidding processes. So, RE in the US only gets built if it is the most cost competitive RE. As a new California “resident”, these numbers scare the crap out of me. I’ve been tempted to install solar on a home I recently purchased just to remove any dependence I have on the public grid. I’m not really new to CA, I’ve had a house here since 1982 and the one I’ve owned since 1986 has a solar array with battery backup and a 15kW propane generator. It’s in a remote area with poor grid reliability and it works very well, in fact I was able to recover the entire cost of the system in less than 8 years. But the new place doesn’t have those grid reliability issues and I’d hoped to avoid the expense. Now Gov. Moonbeam wants to shut down the Diablo Canyon nuclear plant, which is right down the road from me and one of the reasons I selected the new house. I hope everyone in CA can see what this administration is doing and show it the door at the earliest opportunity. Does everyone remember the rolling blackouts after the CA power “deregulation” at the hands of Enron? This is going to be much worse unless we stop it now. Surely you can get a much smaller diesel or gasoline generator and some fuel tanks/cans to run the household essentials while the grid is restored (3-4 days?). BTW 15kW seems one heck of a lot of power for a household. Well, it’s a big house 🙂 10 acres, 7000 sq. ft., 1200 sq. ft. detached “cottage”, 5 stall barn, tack room and regulation arena. Pretty big. Operated as a hotel in Big Basin State park for 20 years. It’s big. I needed reliable power. Customers paying premium rates for premium accommodations expect it. For my new “downsized” personal residence I could easily get away with a 5kW gas generator and no solar. Since I have natural gas to the front door I expect I’ll just do that. I hate hauling gas cans, did it for decades and I just don’t want to do it anymore. But I’d [b]really[/b] like it if Gov. Moonbeam stopped f*cking with the California grid. My $0.02. Maybe I should say the idiotic, non-standard, brainless WordPress translations. Ah, there’s large business component. That makes much more sense. If your new property has similar requirements, then I don’t see how you can avoid the backup cost. Will the gas still flow in the event of a major blackout? 15 kW is not so much. I live in a fairly remote area- 40 km from the nearest town with frequent blackouts. I installed a 12 kW auto start propane generator 13 years ago when I built my new farm house. 12 kW is barely enough for basic power during a power outage. Don’t run tools or microwave unless shutting something else down. Oh wait. I’m already st 12 kW. So, at times I have to shut certain things down during a power outage to stay within the capability of my gen set. Like shut down the heat pump and crank up the wood fireplace. When the power is out for a day or more, it can be a chore. A person I know has made a fortune off putting windmill foundations in, in the area I live. Basically, everyone using the electricity from these things are just sending him a check every month with no upside. Same old electron we had 10 years ago, just a different supplier now charging more for the same because the government says so. It is not all roses in the US. The state of Massachusetts is scheduled for a whopping 40% increase in rates next month. This is due solely to RGGI, the Regional Greenhouse Gas Initiative. At least 5 coal plants have been shuttered and reserve capacity is nil. The plan (unbelievably) is for all the local regions to import electricity from each other when shortages occur. Nobody seems to understand that this is a formula for a grid collapse at the first sign of a shortage. Too bad they shelved the gas pipeline project running through Mass. and southern NH, from lack of interest and political opposition. That could have helped a lot. Now hopes are on Northern Pass, bringing hydro power down from Canada. But that has faced fierce opposition as well. I guess it will come down to using pixie dust and unicorns for our power. The footprint of wind power turbines is seen in the broken and dead birds at their base, the greatly increased power bills of users, and the medical problems induced in local residents, as well as ceaseless blackout, while power authorities struggle to balance loads and maintain supply under wildly varying wind speeds. Larry Hamlin presents an awful mess in this article, mixing spot prices with national average prices, as if those should, or even can, be compared. He also omits a key reason for lower recent US electricity prices, related to the lower natural gas prices that he did mention. Many utilities (including in California) have retired inefficient gas-powered Rankine cycle power plants (steam plants or steamers in the industry jargon) and replaced them with much more efficient combined cycle gas turbine (CCGT) plants. “renewable energy…lead to higher electricity costs…” — totally false. The real (inflation-adjusted) price of California residential electricity has DECREASED since 1990 by almost 12 percent. see link to article and Figure 1 displaying real and nominal residential prices for California (per EIA). The plot shows nominal price was 10 cents in 1990 and 16 cents per kWh in 2014. The chart also shows that California prices (real, adjusted for inflation) have not increased at all since mid-1997. Therefore, it is quite false to state that renewable energy has lead to higher electricity costs. Second falsehood: “renewable energy …. has … exposed the state to increased electric system stability concerns…” The state grid operator and utilities are well aware of the impact of wind power and solar power, so perhaps there is a “concern.” However, what minor concerns may exist are already planned for and taken into account as evidenced by the California grid stability even though approximately 8 GW of solar power flows into the grid during peak sunlight times, and 4 GW of wind power flows during peak wind events. Eight GW of solar represents approximately one-third of daytime demand, depending on the day, while wind rarely exceeds 2 GW during those same periods. The very fact that California no longer has un-responsive nuclear plants at San Onofre (the SONGS twin-reactor plant) is a significant factor in having a responsive grid. That 2200 MW of power that no longer flows from SONGS was replaced, for the most part, by agile, fast-responding CCGT power plants. Finally, the falsehood of “the need for significant out of state power to maintain system reliability.” That is a complete twisting of reality. First, California imports hydroelectric power from Hoover Dam on the Nevada/Arizona border, and has done so for decades. The dam produces less and less power as the western drought continues. Second, power is imported from the Palo Verde nuclear power plant near Phoenix, Arizona, with approximately 930 MW flowing to California when the reactor is operating. Third, approximately 5 percent of all power sold is from coal-fired plants that is imported. Fourth, some power from the Pacific Northwest is imported, both hydroelectric and wind power. A better statement of California’s power importing policy is that out-of-state producers have an excess of power to sell, insufficient customers to buy it, and a ready and willing market in California. Renewable-haters love to cry about the waste of resources in building backup for renewables, yet how much of a waste would there be if California refused to import cheap and available power, and built the equivalent of those generating resources in-state? It must be understood that in 2015, California imported approximately 98,000 GWh, which would require approximately 16 GW of power plant to generate in-state. Which is only needed because CA has all that unreliable wind and PV that only produces electricity as the conditions allow rather than as demand requires so the thermal generators have to be “responsive” and adjust continually. No, the out-of-state producers peaking plants are now run more often to provide CA the power it needs to ride out the intermittency of the unreliables. And they make good money from it as CA has no other option but to import the power when the unreliables decide to take a nap. The CA import transmission interties are set to trip out when exporting regions need the power quickly. Additionally, instabilities in the system will separate CA from the exporting regions automatically. The exporting regions learned from the last CA-caused regional blackouts. Roger, industrial and commercial customers in CA subsidise residential. Get a grip on reality. Unfortunately, for my barber who had a $700+ electric bill recently, the scenario output(s) developed by the CEC for the residential market were all a lot lower than the actual costs for a kWh from PG&E a couple of months ago!!! So you are only concerned with residential (voters) on price? By the way if I had to pay 16 cents per Kw/hr that would be a 60% increase in residential cost. I believe the article compared California rates to the rest of the nation. left wing supporters who love to pay more tax and see the state go over the financial cliff . in California . The province of Ontario is doing the same thing and fuel poverty deaths will grow just like in Europe . 30,000 per year . Kind of puts the apparent tragic 18 deaths from the Matthew storm in some perspective . Governor Brown thinks higher taxes will control climate change . Now that is a real Denier . Coal for electricity, natgas for hearting, cooking and industry and petroleum for transportation. That’s how it was before Israel’s ’73 war when the Chosens first started screwing around with the West’s energy supplies. And they replenish the earth’s depleted CO2 and may even cause some beneficial warming. A lesson for Alberta in the National Post – article by Terry Corcoran. This cover article in the National Post provides a lesson for Alberta, and especially for the NDP. Their green energy plan to replace coal-fired power in Alberta with wind and solar energy will be a debacle, just like it is in Ontario. Increasing energy costs will cause enormous harm to Albertans as it has to Ontario – job losses and destruction of the economy are only the beginning. HOW ONTARIO’S PURSUIT OF RENEWABLE ENERGY BROKE THE PROVINCE’S ELECTRICITY SYSTEM. I expect this how the NDP plan to finish off Alberta’s energy and petro chemical industries. We already have the cheapest cleanest reliable power in north America with rates that run between 4 to 5 cents KWH. Don’t be fooled. My California electricity bill was reduced several months for reasons that boiled down to “we stiffed businesses for money that we don’t need so we are giving it to you”. I defy anyone to prove otherwise. Here’s what’s fun: The Feds can print money to subsidize renewables, but CA has to increase taxes or raise rates. It’s a scream when CA tries to follow the Feds in renewable scams. Businesses leave because CA shifts costs from voters (ha!) to producers. Re-newables are not the only contributor to the price increases in Australia, many parts of the network, such as the poles and wires, were so run down they needed upgrading. Are you sure about that, Patrick? 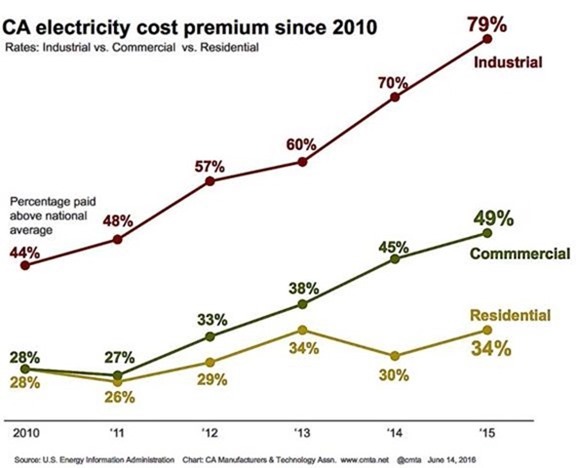 On RenewEconomy, they keep talking about how the grid operators keep driving up electricity rates due to the “gold plating” of the grid. Are you implying that Giles et al are hideously wrong? I understood also that in some parts of Australia future demand was over estimated and there’s been an over supply of generation? Capital costs for that supply pushed up prices?? Not BS. I said the wires and poles were a contributor to an increase in power prices, and it is true and well accepted in the industry at the time. In the last half of the 2000-2010 decade Howard and Costello made it so at the time that the 10 or so independent regulators were replaced with 1, IIRC. However, what is not well known to most Australians is that the power generators and suppliers would not accept that unless they held control of that regulator. So, Australians ended up with power generators and suppliers who controlled data/information given to the regulator who also controlled the regulator. Well, what went wrong was generators/suppliers were “gold plating” pretty much anything they wanted. They were also installing infrastructure that was not needed (De-sal plants was another white elephant), but that infrastructure was based on their data (Predictions of future growth in demand) that they gave to the regulator they controlled. What could possibly go wrong with that? We now have fairly pricey power. That is not the transmission and distribution system O&M and replacement. Can you state what I have stated is somehow inaccurate? It used to be true that Federal deficit spending and printing money could counter down business cycles. But, like every great idea, the Feds flogged that one to death to please whatever special interest cropped up. Now, Federal spending is such a huge part of our economy that Fed monetary and fiscal (ha!) policy has little or no impact. You tell me how long the Fed has been dithering about their discount rate? Do we have any Technical experts in this area who could tell us if it is realistic and cost productive to power a major city by placing the power lines underground? In Germany, where for the time being the wind farms of the northern coastal areas have to be connected to the power grid in the south, costs are estimated that 1 km of power lines above ground is € 1.4 mio, under ground € 8.0 mio and more in urban areas. Lifespan above ground: 80 years, under ground: 40 years. Can a return on investment be expected within a reasonable time span? Or does a high energy price reduce competitiveness so much that such a project never pays for itself? The UK Western HVDC line has been routed under water… not an option of course in most palces! This is not replicable outside the US (the US market not be allowed to export till recently effectively dumped large amounts of gas on a closed market). 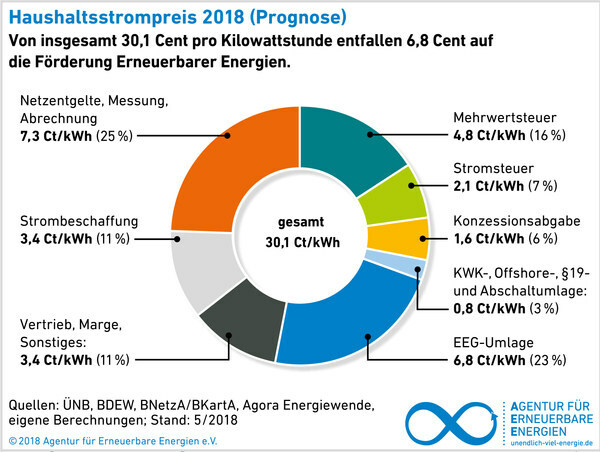 German wholesale electricity prices are declining year on year… while domestic electricity rates are high, Germans use less electricity and may have solar or shares in renewables to offset cost. I am paying $0.08/KWH for coal generated power. A kilowatt hour was traded on 09.10.2016 at the electricity exchange with 3.49 € ct / kWh. (About 0.04 USD) which means electricity costs almost nothing. The high price for consumers comes from the vendors and the taxes! The high price for consumers comes from the vendors and the taxes! The average price is ~ 0.04 €/kwh (supply and demand). The price a consumer has to pay when the energy runs through his meter is approx. seven times higher. It’s a rip-off. Germany’s high electricity prices are slightly misleading, as they subsidise industrial usage at the expense of the domestic user. Not sure how they do that, considering the EU’s anti-subsidy regulations, but they do. France and Germany have always worked the EU to their advantage, while sticking two fingers up at the letter of the law. This was one reason why the UK left the EU – they got fed up with the double-standards. We played cricket, while the French and Germans were playing poker…. How comparable are all these numbers from place to place and country to country and decade to decade as they play games with how the numbers are presented? My bill says my electricity costs 10.3c/kWh up to 600kWh and 12.1c/kWh above that. Until the spring of 2015 the point at which the rate jumped was 1,000kWh and a few months before that they canned the “smart meter” program in this area which also had three different rates based on time of day. Then there is the whole list of “charges” which are not regulated like the actual cost of the electricity, like transmission, debt retirement, administration, etc which in any other business are simply included as part of the cost of your product or service. Simple is good. I divide the total monthly charges by the total number of kWh of electricity which they say I have consumed (how would I know if it was wrong?) my cost varies from 20 to 36 cents/kWh depending on total electricity used each month. That is the number which I would like to see printed boldly on the front of every bill. That is the actual cost I pay. Oh yes, please note that although the presumed electricity charge/kWh increases with usage the actual rate I pay is inversely proportional to my consumption. So who gets hit the hardest per kWh? Those on low and fixed incomes living in modest accommodations using the least power. So much for encouraging energy conservation.